This is a perfect location for a retreat from the hustle and bustle of city life! Windancer Lodge is perfect for large families and reunions, or for a couple to snuggle up together in solitude. The lodge easily accommodates 16 people with plenty of rooms and beds for everyone. Each morning you’ll wake up to breathtaking views of Cascade Lake and West Mountain visible from the front side of the lodge. Enjoy relaxing dinners on the huge balcony overlooking a sleepy meadow on the backside. While enjoying the scenery, you are likely to spot a fox, rabbit or deer passing by. A large campfire area is available adjacent to the cabin for roasting marshmallows and enjoying the stars! Comfortable and upscale furniture is found throughout the cabin. The main living room area accommodates two split areas. One can snuggle by the fire on one side, or sit and enjoy mountain and lake views on the other. The lodge has places of refuge for everyone! With large bedrooms, and a loft upstairs with books to read, everyone is sure to find a special spot for some privacy and solitude. Downstairs you’ll enjoy a game and entertainment room where children and adults can play with Nintendo games, watch DVD's, play air hockey, throw darts, or play pool; Another TV/DVD/VCR available in the Master Bedroom. New! Tv's with DirectTV in 2 upstairs bedrooms! Whether you’re looking to find solitude or entertainment, Windancer Lodge has it all! Lake Cascade is just 250 yards from the front door. Just far enough away that young children can't wander into the water, but close enough for older kids to be able to walk back and forth at their leisure. Parking is no problem--there is room to park a boat, RV and several cars! Additional parking and public boat launch are just yards away at the public campground. You can even leave your boat in the only protected bay on the southern end of the lake and walk up to the cabin. In the winter, the lake is blanketed with a solid layer of ice and snow making snowmobiling and ice fishing a must! Trails for motorcycles, mountain biking, horseback riding. snowmobiling are literally either out our back door or just up the street. Snowmobile across the lake and up West Mountain where there are miles of snowmobiling trails. Tamarack ski resort is only 30 minutes away. Brundage ski resort is 1 hour away. We have the best tubing hill just outside our back door! Or we can point you to an even bigger hill where we take our snowmobiles and haul kids up to the top for non stop fun! Homebodies can stay indoors and enjoy Satellite DirecTV. Don't miss your favorite team! High Speed Wifi internet is also available for your convenience. Cell phone coverage is available too. The Lodge is always clean and fully stocked. We are used to feeding large crowds with large pans, crock pots, etc. We have blenders, mixers, coffee pot, toaster oven, air popcorn popper, large griddles and more. Washer and dryer available too. Come get away! Windancer Lodge is the perfect place to stay! 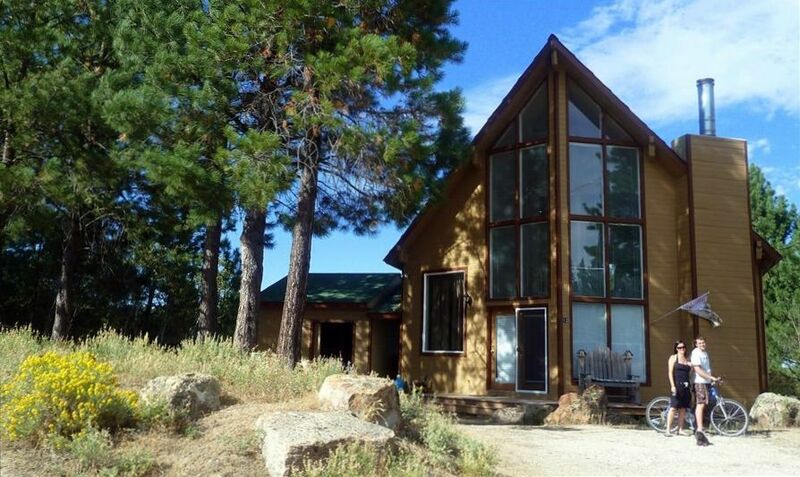 Please Refer to listing VRBO Listing #208638 Windancer Lodge when requesting this vacation rental. We love the outdoors! Snowboarding, wakeboarding, kiteboarding, windsurfing, etc. I grew up on a small private lake in Northern California and this is as close to the Huck Finn childhood that I remembered. It has it all. Rafting, kaying, canoeing, fishing, hunting, snowmobiling, sailing, boating, kiteboarding/skiing. Perfect sunsets. Campfires and warm cozy fires in the fall. It's the greatest. Sledding out our back door. Snowmobiling right out our back door. Walking just a few hundred yards to the beach. Parking our boat in the cove. Hanging out with family. Puzzles by the fire. Family reunions with room for everyone. Wildlife. Fall walks. Eating out at local restaurants like 'Grammas' and the LakeView restaurant. Hunting and motorcycle riding on trails nearby. Horse back riding in the fall especially. White Water Rafting just 15 minutes away. You name it we've got it! Downtown Cascade is just 2.5 miles away. Shop, go to the theatre, fill up your boat or snowmobiles minutes away! Tamarack is 25 miles away. Brundage Ski Resort is about an hour away. Our property is adjacent to BLM land, so there are acres of trails and snowmobile access. Cascade is very much like a small village. A small population with very friendly residents. Cascade Lake is a very Large Reservoir. It is a warm lake with good fishing: Trout, Blue Gill, Perch. Ice fishing in winter. Blue Heron Campground and Boat Launch is 250 yards from our door. Payette River: (North Fork, South Fork and The Main) are all within a 30 minute drive of Cascade. Kelly Whitewater Park is just 5 miles away from our Lodge. Beach is 250 yards away. Within a 4-5 minute walk. Golf course is less than 2 miles away. Amazing view of the lake and West Mountain. Lake is 250 yds. away. Just far enough away to keep little ones from wandering into the water, but close enough that teens can easily walk back and forth at their leasure. Lake front is 250 yards away. West Mountain often has snow until early summer. Cross country ski in and out!!! Cross country ski trails outside the back door. The lake is often frozen and you have miles of smooth cross country skiing! View of the lake from the Lodge. Our campfire has a view of the lake. In winter you can cross country ski across the lake. Ductless air conditioning provided on upper floors. Basement stays cool in summer. Electrical heating. (baseboards in every room, Gas fireplace downstairs instructions above. Ductless Heat in upper 2 floors. Extra blankets and pillows in closets in each room. Detergent available for a couple of loads. Bring more detergent if needed. Dryer sheets provided. Please clean lint from dryer. Make sure flue is open. Turn off fan and close glass doors when starting fire. Turn off fan when adding wood to eliminate smoke escaping. Plenty of room for several cars, an RV or large boat. Ask for details. The internet should be on when you arrive. If it is not working, turn it off for a few minutes and then back on again. Towels will be provided in each room. Extra towels are in bathroom cupboards or Master Bedroom. Spacious. Seats 20 or more. Place detergent tab in the BOTTOM of the dishwasher. For some reason the detergent dispenser does not open far enough to let detergent out. Please use splatter shield to keep the microwave functioning properly and clean. Extra card table and chairs for additional seating. 2 picnic tables on back deck. There is also another picnic table out by the campfire. Basement: 1 Large TV (DirecTV), 2nd TV for nintendo games Bedrooms: Each bedroom has a TV with DirecTV access. DirectTV. Please make sure the remotes do not leave the room they are assigned. 1 DVD player in the basement and 1 in the Master Bedroom. Adult, teen and children books available. Air Hockey, Pool Table, Darts, and Entertainment Center with Nintendo. Bring your own games. Unfortunately access to games resulted in loss of many of our games. We no longer provide them since not all renters are careful with collecting all the pieces. There are a few toys available for toddlers. We have a variety of videos and DVD's to watch. We encourage you to bring your favorites. Meadow below. The kids slide down the grass on saucers or in winter we have a great sledding hill. NEWLY constructed (2018) Main Floor Deck. Please do not allow small children out on the deck alone. We recently added another deck out from the Game/Media Room where one can relax in hammocks. Available upon request. Not guaranteed. $8/day rental. Parking for boats down at the boat launch 250 yards away. Room for boat parking at the Lodge as well. Porch on the front of the Lodge looks out over the lake and has Mountain Views. Deck in front of cabin for view of lake and West Mountain. Deck in back where you can grill and eat outside. 2 courts in town. 2 miles away. Kelly’s Whitewater Park has a community pool open year round. Road accessible year round. Sits just a few yards from the lake. Boat launch is just down the drive. Wonderful view of lake and West Mountain. Fully stocked Huge!!kitchen. Round table with center turntable seats 10, more seating on deck and room for more tables in kitchen. We have our own backyard tubing hill in winter! This cabin is perfect for family get away. It’s very quiet, and perfect location. We loved the game room and the relax areas. It was just perfect for winter activities. Thank you so much for your review! I hope you were able to take advantage of the sledding hill out back! We are so glad you enjoyed our game room! We are looking forward to spring so we can expand the games and fun out onto the deck when it warms up! We hope you will come again! This home seems to be overstated and overrated in our opinion after reading other reviews and staying ourselves. When we arrived , there was an occupied RV parked within 50 feet of the home which was plugged in to the home with an electric cord and water hose which made us feel that we were sharing the property with other occupants. The owners son stopped by later and said that he stays in the RV when the home is being rented. Upon entry to the home we found food crumbs on the sofa, unswept floors and candy wrappers on bedroom floor. We found a dirty scrambled egg pan in the oven later when preparing to cook dinner. Shower curtain in main level bathroom was moldy. Many walls and doors had hand prints and dirt on them. In the kitchen there is a support beam with drywall chipping off the edges. This home Needs a deep cleaning, some minor touch ups and some interior paint and it would be great.Otherwise it was great for a family get together, good location and as said before very comfortable and functional. We have used Vrbo, vacasa, and other home rentals multiple times and always have been impressed with cleanliness up until now. A new cleaning service would work wonders. I am so sorry that our cabin was not up to its usual high standards. Former reviews do accurately describe the experience of our renters and I am sorry that yours was not up to par. We have been remodeling off and on all summer, the remodel was supposed to be finished by your stay. I am still trying to understand whether the construction crew went in and used the cabin AFTER the cleaning crew had already come in and cleaned....or whether the cleaning crew did not have ample time to clean because the workers did not finish on time. Either way, this was unacceptable. It is absolutely not what one should expect at our location. I'm sorry you were bothered by the RV on the property adjacent to the cabin. (It is a separate property owned by our family). The RV is not there all summer but when we have used it, we haven't had a complaint. We will certainly take your concerns into consideration for the future. We stayed at the cabin this past weekend and it was sparkling clean and the remodel was finished. Your experience makes me blush since I have never had an unhappy renter and I tried so hard to make sure that the remodel didn't interfere with our guests. I have remedied all that you complained about and again am so sorry that your experience was not to my high standards. I will be uploading the new photos that show all the projects that were accomplished this past year which include: Newly remodeled bathrooms on main and upper floor (the upper bathroom was remodeled after your stay), french doors added on both the upper and lower decks to expand the view to the Meadow, finished stairs to the newly built upper and lower decks, wrapped beams on ceilings and in the kitchen (the one that you noticed was chipped), new rock chimney on the outside of the cabin, replaced windows in Great Room, new electric blinds on all Great Room windows, new iron bannister, new tile floors on the main floor, Newly painted kitchen cabinets (last fall). Next year we hope to build another cabin on the property adjacent to our current cabin which will allow for larger family reunions. We loved that this house could hold all of our family (12 of us - 7 adults & 5 children). It was an short, easy walk to Cascade Lake (which the family made daily use of). The owner was very helpful and always available for any questions. There is a large deck (and a smaller, new one is being built on the side of the house) that makes it wonderful for just relaxing. We could watch the squirrels and birds as well as enjoy all the trees. Loved being there. We always love to hear that our guests enjoy our cabin as much as we do! We have been updating our cabin for the past two years. Our new upper and lower deck are a such a great place to relax, barbecue, and enjoy the scenery. People love the hammocks hung on the lower deck. The 2nd set of stairs from the parking area will be completed this fall....and we are planning to add a rock fireplace indoors! We still have a few more projects...so our cabin will just be more awesome in the coming months! The lodge was everything we hoped it would be. Everyone in our group had a very comfortable stay. We would definitely consider staying there again. It was an amazing time. The Windancer cabin was great, had lots of room and everything we were promised was provided. The owners were easy to work with. We loved our family time and our grandkids had a great time.Thanks for a wonderful Christmas! Thank you for your kind comments. We have 4 Tvs in the cabin. Three are in bedrooms Two are large screen TVs, one of which is downstairs in the Game Room. We have chosen not to put a TV in the upstairs great room so our family and guests can take advantage of the opportunity to visit, play games, dance and enjoy the fire. There is room to board horses on our land or the BLM land adjacent to our property.